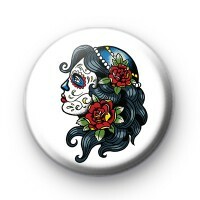 This is a 1 inch badge with a cool old school style tattoo sugar skull lady. Sugar skulls are decorated for the Day of the Dead Festival ~ DÃ­a de los Muertos which is celebrated in central & southern Mexico. The skulls are often so pretty & detailed.